Witty Health Inc., a technology company focused on improving cancer care, today announced the initiation of clinical development of first-ever Digital Immuno-Oncology Product for treating multiple types of cancers with Checkpoint inhibitors. Witty Health’s digital therapeutic is custom built for a specific drug based on drug’s toxicity profile and the type and stage of cancer. They help monitor drugs’ toxicity and patients’ vitals in real-time to improve patient’s Quality of Life (QoL) and potential outcomes associated with the drug. “The Checkpoint Cancer Treatment Platform (CCTP™) is designed to improve outcomes associated with all the five checkpoint inhibitors-Opdivo™, Keytruda®, Imfinzi™, Tecentriq® and Bavencio™ with suitable customization. The current cancer treatment model does not monitor a patient’s condition between office visits and it is not working and we believe our products can significantly reduce preventable health care costs by reducing ER visits and hospitalizations due to symptom exacerbations as well,” said Dr. Karthik Koduru, the Chief Oncologist of Witty Health. “It is a unique clinical strategy to combine the therapeutic effects of Immuno-Oncology drugs with the monitoring and analytical capabilities of software and machine learning tools to improve the Quality of Life (QoL) and outcomes’ said Dr. Muhammad Omer Jamil, MD, a Medical Oncologist and Hematologist at Edwards Comprehensive Cancer Center (ECCC) / Marshal University - Huntington, WV. The Immune cells (T Cells) have certain types of proteins which target specific defensive mechanisms of cancer cells. These are Checkpoint proteins, and the monoclonal antibodies that target them have shown an impressive response in treating diverse types of cancers. There are two types of Checkpoint inhibitors depending on the kind of checkpoint proteins (PD-1 or PD-L1) they inhibit. Two PD-1 monoclonal antibodies - Pembrolizumab (Keytruda® from Merck) and Nivolumab (Opdivo™, BMS) and three PD-L1 monoclonal antibodies- Atezolizumab (Tecentriq®, Roche), Avelumab (Bavencio™, Merck KGaA/Pfizer) and Durvalumab (Imfinzi™- AstraZeneca) have been approved by the FDA for treating multiple types of cancers. The approved indications include Advanced Non-Small Cell Lung Cancer, Metastatic Melanoma, Advanced Renal Cell Carcinoma, Squamous Cell Carcinoma of the Head and Neck (SCCHN), Advanced Bladder Cancer, Hodgkin Lymphoma, Liver Cancer (Hepatocellular Carcinoma) and Advanced Colorectal Cancer. A research forecast projects the overall world checkpoint inhibitor cancer treatment industry will achieve revenues of $16.55 billion in 2020. 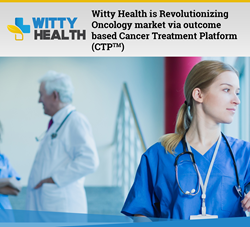 Witty Health’s Cancer Treatment Platform (CTP™) is a digital platform with a suite of tools that help improve cancer care. It can be connected with up to eight devices: a wireless weighing scale, blood pressure cuff, pulse oximeter, stethoscope, thermometer, multi-scope camera, Electrocardiogram (ECG), and blood glucose monitor. These tools create data which can be remotely uploaded while the patient is video conferencing with the physician - in real-time or offline, from home or office. Cancer Treatment Platform (CTP™) includes drug specific toxicity management pathways to help oncologists address toxicity efficiently and promptly to improve Quality of Life (QoL) and potentially improve outcomes of the treatment. Witty Health’s Cancer Treatment Platform (CTP™) is protected by some novel patent applications covering the treatment with Checkpoint, CDK 4/6, PARP, ER and Factor X inhibitors and pain management during cancer therapy. Witty Health, Inc. (http://www.wittyhealth.com) is a Houston, TX-based technology company focusing on intelligence-powered, real-time health risk monitoring tools to improve the clinical experience. Witty Health, privately held by employees and outstanding physician/oncology leaders, is redefining the immunotherapy-based cancer treatments through the development and commercialization of its proprietary Cancer Treatment Platform (CTP™). Witty Health Inc. has assembled an experienced management team and invested by some outstanding physician/oncology and pharmaceutical leaders.